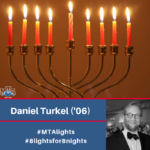 Today’s MTA Chanukah Light is alumnus and YUHS Board member, Daniel Turkel (MTA ’06, YC ’12, RIETS ’14). Mr. Turkel is a Partner at a real estate investment firm. He is also the Founder of Chesed L’Yehoshua and serves on its Board, in addition to serving on the Board of Congregation Zichron Shalom. As an active alum and Board member, Mr. Turkel is instrumental in fostering the growth of our community and engaging our young alumni. “The sense of history at MTA is incredible. You feel that you are part of the mesorah the second you step foot in the building. Walking down the same halls that my father and his friends walked, that my rebbeim and their rebbeim walked, to me, is one of the most humbling experiences. As a high school teenager, I experienced and appreciated for the first time what a true sense of devotion and dedication looks like by watching my teachers and rebbeim. This is what had the greatest impact on me during my four years at MTA. Looking back on it now, it is clear that this was also the most impactful experience in both my personal life and professional career. I have a clear understanding that there is no substitute for genuine commitment and dedication and I strive to emulate those qualities as I look to be a role model for my kids and an effective co-worker at the office. As early as I can remember, my parents and grandparents instilled in me the importance of hakarat hatov. I owe so much to MTA, the faculty, the rebbeim, and the friendships I formed there that still remain today. As an alumnus, it’s important to me to give back to MTA, where I gained so much, and to encourage my fellow alumni to do the same.” Thank you, Mr. Turkel, for your devotion to our yeshiva and for enhancing our community with your light.